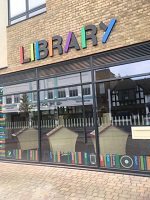 Horley Library will close at 5pm on Saturday 13 April and reopen in the newly refurbished site in Russell Square at 9.30 on Tuesday 30 April. During this closure you may use any other Surrey Library, the nearest being Redhill, Reigate and Merstham. We apologise for any inconvenience caused. The library has automatic doors and a hearing loop is installed. The library has assistive technology for people with disabilities. Please see: Library services for people with disabilities, for further information. Horley Library is situated in the main shopping street of Horley town. Horley Central pay and display car park is located across the road from the library. There is 1 disabled space at the rear of the library off Russell Crescent.